Aristokraft is a subsidiary of MasterBrand Cabinets, Inc., an industry leader that comprises a breadth of quality cabinet brands. Since 1926, MasterBrand Cabinets has earned its reputation as America's Cabinetmaker, and the Aristokraft brand is known for its style, selection and value. Aristokraft has the style, selection and value you need to bring your vision to life. With our speedy delivery and industry-leading service, we’ll keep your new construction or remodeling project on time and make planning your dream home simple and enjoyable. At Aristokraft, we’ve been creating quality cabinets with an eye on affordability since 1954. Our products reflect over 50 years of know-how by featuring state-of-the-art finishes, easy-clean interiors and dependable hardware ­ all with great style in mind. In fact, our dedication to the craft has made us one of the most widely used and trusted brands in the industry today. Aristokraft cabinets are backed by a five-year warranty on all workmanship and manufacturing defects, and a lifetime warranty on all drawers, drawer guides and hinges. 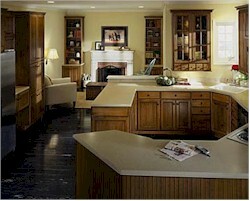 A wide selection of appealing and proven designs in an array of finishes makes it easy to find the cabinets you want. Professional builders (and homeowners, too) benefit from our unique builder’s promise of being affordable, easy to spec, and on time - with a delivery record that’s the gold standard in reliability. Our quality and service has earned Aristokraft the Good Housekeeping Seal. Aristokraft is one of 12 great cabinet brands in the MasterBrand Cabinets Inc. family.